Kathai Conservation Park is a protected area in the Australian state of South Australia located on the Eyre Peninsula in the gazetted locality of Duck Ponds about 5 kilometres (3.1 miles) south-west of Port Lincoln. The conservation park is located on crown land in section 328 in the cadastral unit of the Hundred of Lincoln and which includes “a large hill” of a height of 145 metres (476 feet) above sea level called “Northside Hill.” It was constituted under the National Parks and Wildlife Act 1972 on 7 November 1985 to “protect and conserve habitat and wildlife within the Uley catchment basin.”  It was proposed to be named as the Northside Hill Conservation Park but ‘Kathai’, the aboriginal name for the hill, was approved by the Geographic Names Board. As of July 2016, the conservation park covered an area of 81 hectares (200 acres). The conservation park is dominated by an “open mallee forest” of coastal white mallee over an understorey consisting of tall shrubs of dryland tea-tree. 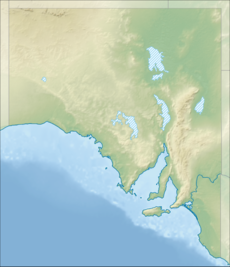 The purple-flowered mallee which is considered to be “regionally rare“ is found within its boundaries. The conservation park is classified as an IUCN Category III protected area. ^ a b c d e "Conservation Parks of Lower Eyre Peninsula Management Plan" (PDF). Department for Environment and Heritage. 2007. pp. 1 and 15. Retrieved 20 June 2016. ^ a b c "Protected Areas Information System - reserve list (as of 11 July 2016)" (PDF). Department of Environment Water and Natural Resources. 11 July 2016. Retrieved 14 July 2016. ^ a b "Search result for "Kathai Conservation Park" (Record no. SA0034383) with the following layers selected - "Suburbs and Localities", "Hundreds" and " Place names (gazetteer)"". Property Location Browser. Government of South Australia. Retrieved 15 July 2016. ^ "NATIONAL PARKS AND WILDLIFE ACT, 1972: SECTION 30—KATHAI CONSERVATION PARK CONSTITUTED" (PDF). The South Australian Government Gazette. Government of South Australia: 1362. 7 November 1985. Retrieved 18 January 2017. This page was last edited on 11 January 2019, at 22:16 (UTC).